Dynamic delivery. Instant access to content on-demand. The right content. Content that is accessible and appropriate for the device on which it’s being consumed. It’s something content consumers expect, but few content professionals understand this. But that’s about to change. As companies begin to recognize the complexities of delivering content across all customer touch points—including The Internet of Things—the automated delivery of dynamic content is no longer just nice to have, it’s a business imperative. 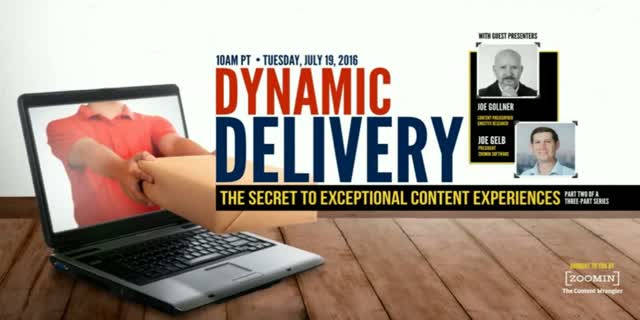 On Tuesday, July 19, 2016, join Scott Abel, The Content Wrangler, Joe Gollner, Director of Gnostyx Research, and intelligent content guru Joe Gelb, President of Zoomin Software for part two of a three-part webinar series on content delivery. In this webinar, you’ll learn what dynamic delivery is, why it’s needed, and how it works. You’ll discover why an enterprise-grade dynamic delivery platform is required to ensure both prospects and customers have access to the right product content across all touch points in their journey.